On behalf of the Fur Institute of Canada and our Board of Directors congratulations to all the award winners. Ron Lancour has been actively involved in promoting the fur trade in Canada for more than 45 years. Ron began on the BC Trappers executive in 1971 with 8 years as vice president, followed by 7 years as President. He is credited with starting the BC Trapper Magazine and the Trappers International publication for NAFA. Ron was an early instructor within the BCTA and was a founding contributor for the BC Trapper Education manual. He continues as an active instructor in BC today, as well as member of the Trapper Education committee. Ron worked for over 10 years as depot manager in BC and North Bay and has served at the national level he served as a director of the Canadian Trappers Federation, director of the FIC, chair of the FIC Trapper Education Committee and director for the FIC Trap Research and Development Committee. Over the years, Ron has always been a great instructor and supportive in education and advancement of the fur industry. Today he has embraced the new online age, very active on chat groups, Facebook pages and online forums to educate not only trappers, but the public at every chance he can get. He is always a regular contributor of magazine articles and live demonstrations at the annual BC Trappers AGM meetings. 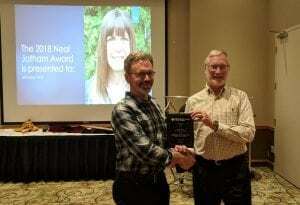 He is also the recipient of the Norm Mackenzie Award for Outstanding service to the BCTA. Michelle Hiltz has been involved with the Fur Institute of Canada since 1994, initially as a statistician. In approximately 2000, she took over the Humane Trapping Program at what was the Alberta Research Council, then Alberta Innovates – Technology Futures, and now InnoTech Alberta. During this period she played a key role in research to validate techniques to assess trap humanness, such as anaesthetized tests and in the evaluation of hundreds of traps to meet the Agreement on International Humane Trapping Standards (AIHTS). Michelle’s key contribution was the development of computer models to evaluate killing traps against AIHTS time-to-loss-of-consciousness standards. He persisted in convincing her supervisor, despite his doubts of the potential for computer models to work at all, that models were the way to go. The computer models she developed were super accurate and reliable. She developed models for all of the AIHTS species and more. These models have saved trap testing on hundreds and hundreds of animals and will continue to do so in the future. Her work ensured that traps used in the past and ones that will be used in the future will advance animal welfare. Although she has stepped out of the leadership role for InnoTech’s Humane Trapping program in 2015 to take on new responsibilities with the company, she remains active with the program as an advisor, and is often consulted on statistical, modelling, and other matters related to humane trapping. 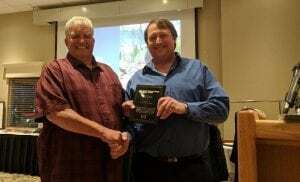 The award was presented by Brian Roberts (FIC board member) and received by Brian Eaton (Innotech Alberta) on behalf of Michelle Hiltz who was not able to be in attendance. The Lloyd Cook Award was presented to Ryan Sealy this year. With his wry sense of humour, quiet confidence and admirable skill in sharing his extensive knowledge, he has been recognized time and again by both program participants and working partners for his exceptional programming. Ryan cares about his students. Whether delivering programming to experienced trappers, novices, adults, youth, First Nations or otherwise, tailors his delivery to encourage maximum engagement and participation. He offers a subdued but powerful voice for trapping ethics, the human connection to the land and the importance of trappers and trapping to wildlife management and land stewardship. His work with the Trap and Research Development Committee reflects his commitment to humane trapping. In his work, he always recognizes the First Nation Traditional Territories that he is working on and collaborates with Elders and Yukon First Nations resource people to enhance student learning. His work with the Yukon Rural Experiential Model, the Junior Rangers, Spring Muskrat Camps, daycares, home schooling groups and various Yukon schools has resulted in glowing reviews from both participants and staff. There is no doubt that his next 20 years or more he will continue to enrich Yukon’s Fur Industry and contribute to the development of best practices and method. The award was presented to Ryan Sealy by Jim Gibb (FIC Chair). The Bernard Cahill Award was presented to Pete Wise this year. Pete Wise has spent his entire life in the bush, as a trapper, wildlife control officer and search and rescue technician, most of these activities in volunteer positions. 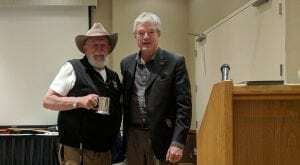 He has volunteered on the BC Trapper Education Committee for many years and volunteers actively at the BC Annual Trapper Convention running workshops and training sessions for new and experienced trappers. Pete is well known for his colourful and memorable back-country survival seminars throughout the province. He has volunteered as a Search and Rescue technician in the Vernon, BC area and the surrounding area for 52 years, assisting or acting as Search Manager on 1,000’s of rescues. In 1992, Pete was given a commendation from the Honourable Raymond Hnatyshyn, for his volunteer work in providing assistance to other in a selfless manner at Pinaus Lake Lodge. Pete was also recognized as British Columbia’s Volunteer of the Year in 1998. In 2018, The Honourable Janet Austin, Lieutenant-Governor of British Columbia honoured Pete with the British Columbia Community Achievement Award for his leadership in empowering others in the community. Pete has volunteered for advising and participating in trap research and has tirelessly fought the rise of the animal rights movement, bringing a lifetime of bush skills, respect for the land and public communications to this fight. In all his endeavours, as a volunteer, leader and mentor that spans the country and beyond, Pete Wise is an exemplary example the values that this Award set out to recognize of a Respect for People, Animals and the Environment. The award was presented to Pete Wise by David Hutton (FIC).